Jo Anne Van Tilburg, Ph.D.
As director of the UCLA Rock Art Archive, I have had the privilege of studying the seminal research of renowned California archaeologist Robert F. Heizer. He spent much of his professional life researching prehistoric art, known as rock art. His son, the famous artist Michael Heizer, grew up exploring his father’s excavations throughout California. Michael Heizer’s masterwork, entitled “Levitated Mass,” is a massive granite boulder weighing 340 tons. 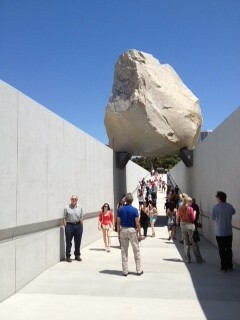 Installed at the Los Angeles County Museum of Art, “Levitated Mass” is a profoundly literal interpretation of “rock art.” Transported from a distant desert quarry, the boulder was moved along a 105 mile route with minimal environmental impact and accompanied by a cacophony of Internet tweets. The space shuttle Endeavor, in contrast, recently traversed the city in a challenging 12 mile journey that Los Angeles Times architecture critic Christopher Hawthorne likened to an ancient ceremonial procession. Both events involved advanced industrial technology, enormous resources, careful and farsighted planning, large numbers of participants and crowds of observers, and were motivated by the goals of history, private passion, and public education. Robert Heizer and I share another interest: the pre-industrial transport of large and heavy objects in megalithic cultures around the world. He speculated about ancient methods of moving Olmec heads as well as Mayan stone blocks and Egyptian monoliths. 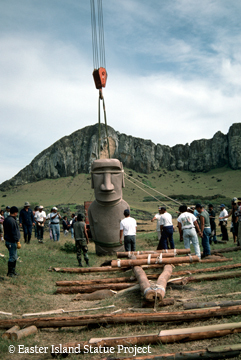 My interest, of course, is Easter Island (Rapa Nui) and the ancient engineering skills and tools needed to transport the stone statues (moai) from the quarry where they were carved to the ceremonial sites upon which they were raised. Eight different experiments to move moai in horizontal (prone or supine) or vertical (upright) positions have been reported over the years, and others have been tried. Beginning in about 1990, I researched probable transport methods based upon known Polynesian techniques and skills, and in 1998 we conducted a successful experiment using a full-scale concrete replica on Rapa Nui. Filmed by PBS Nova, it was an exciting learning experience that drew upon our extensive knowledge and participation in the island-wide archaeological survey. Our experiment demonstrated the viability of our method. The content of this website is copyrighted by Jo Anne Van Tilburg/Easter Island Statue Project, unless otherwise noted.